Jane Lombard Gallery 518 West 19th Street, New York, NY 10011 LERA+ worked closely with American artist James Clar on this exhibition exploring technology’s influence on society. LERA+ created a custom plug-in for Rhino that automated connections for each lit piece. 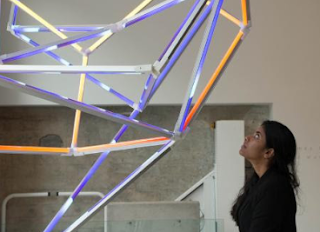 In Rhino, the artist was able to define each connection, assign which sections would hold LED lights and which would be steel rods, and run the plug-in to automate the design of the connections.